The Bloomingdale Neighborhood History Group (BNHG) promotes research and education on the history of the Bloomingdale neighborhood which encompasses our catchment. 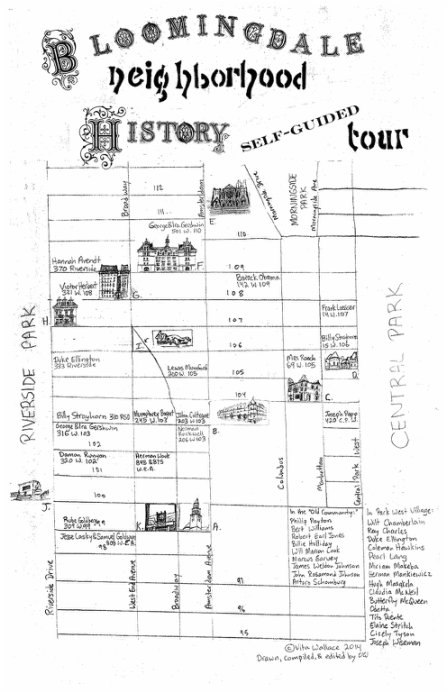 Its former name is the Park West Neighborhood History Group (PWNHG). This volunteer-led group offers a rich and regular series of lectures on our collective history as well as walking tours, and more. The charming self-guided tour map (right) is one of their publications. The group also maintains a collection of research materials on neighborhood history accessible in the Bloomingdale Branch of the New York Public Library at 150 West 100th Street. If you have any material that might add to the appreciation of our neighborhood history and you wish to donate them to the Library Collection please contact the BNHG here. For an excellent historical timeline of our area, please visit their site here. For more information, see their website and their blog.